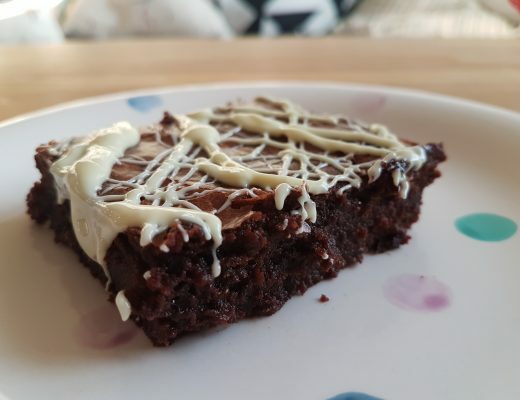 This vegetarian, gluten free recipe looks far fancier than it is. 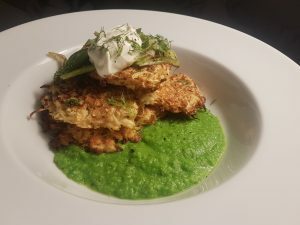 The crispy gluten free celeriac rosti nestle into bright green pea puree and it topped with seared spring onions and a zesty lemon creme fraiche. 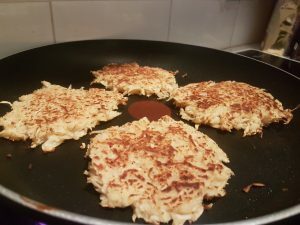 All in all, my gluten free celeriac rosti are quick to whip up and would be perfect for both a midweek meal or as a dinner party dish. 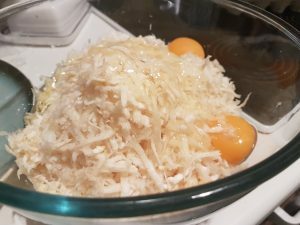 Grate the celeriac into a large bowl. Once grated, squeeze the celeriac and pour away any excess water. Add the two large eggs, beaten, the lemon juice, creme fraiche, milk and flour. Stir the mix well until everything is combined. 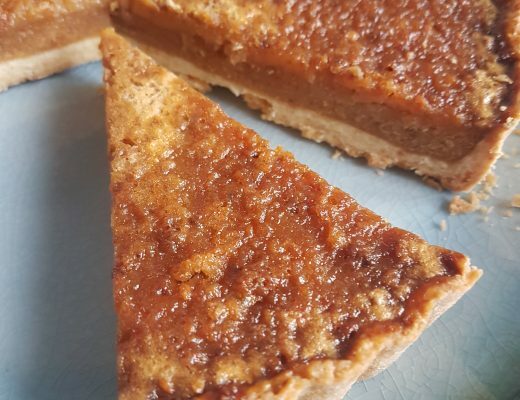 Season with some salt and pepper and a grating of nutmeg. 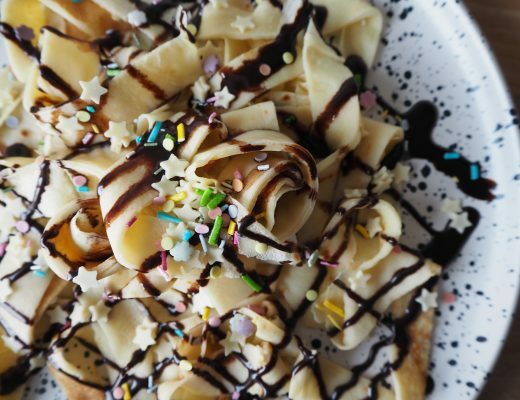 This is you rosti mix, which can now be set aside until you are ready to cook. Now we can start on the pea puree element of this dish, which is incredibly simple. Cook 150g frozen peas in water in the microwave or on the hob until cooked through – remove and drain off the water. Now transfer your peas to a mini food processor and set aside. We will blitz these just before serving. 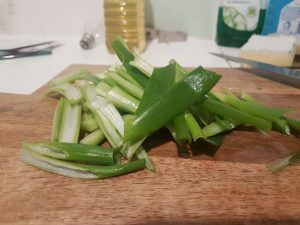 Our final piece of prep is to wash the bunch of spring onions, remove the ends, halve them lengthways, then chop roughly into thirds. Set aside. Time to cook! 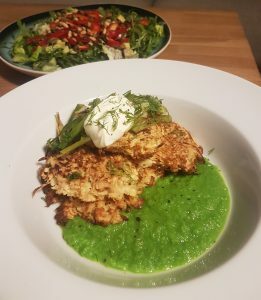 Heat a little oil in a frying pan then dollop the celeriac mix into the create medium-sized rostis (about three tsp of mix for each). Flatten them down gently with a spatula and allow to cook for 5 minutes on each side, over a medium heat. They should be a beautiful golden colour and the celeriac will have become soft, sweet and nutty by the end of cooking. You can keep them warm in the oven while you finish the final batches. 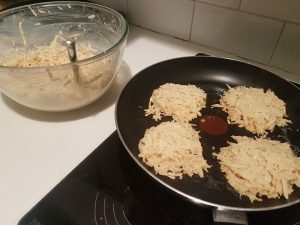 When you have nearly finished cooking the rosti, fry the spring onions for 3 minutes in a medium-hot pan. They should stay bright green with some searing on the outside, but be starting to wilt slightly. Blitz your peas until you have a nice, smooth puree. Spoon this onto your serving dishes, and smooth out with a spoon to create a bright green base layer. Now place your rostis on top of the peas, with the spring onions piled on top. To finish, a dollop of creme fraiche, sprinkling of chopped dill, a pinch of lemon zest and some black pepper. Beautiful!